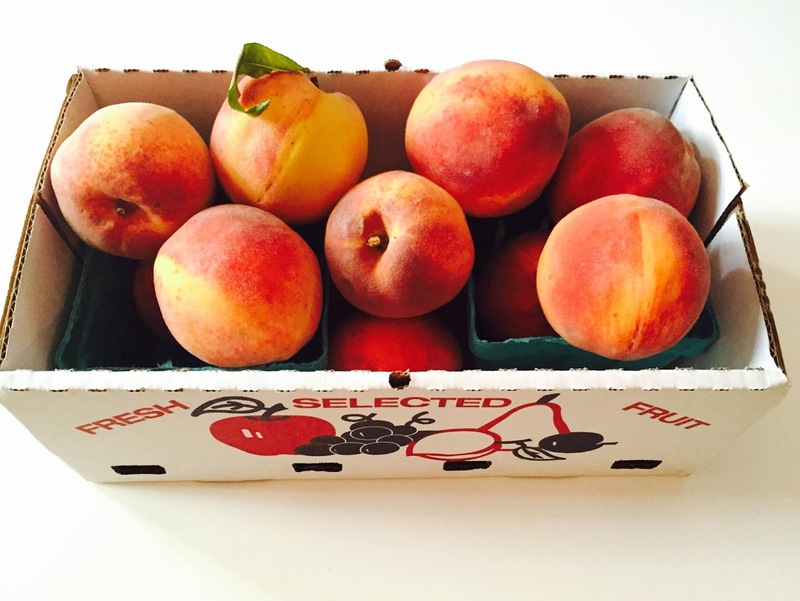 We've been getting juicy southern peaches in our CSA "Fruit Lovers" add-on for the past few weeks. They're gorgeous, right? I've used a fair number making my very favorite summer salad. But this past week, I decided we needed something sweet! 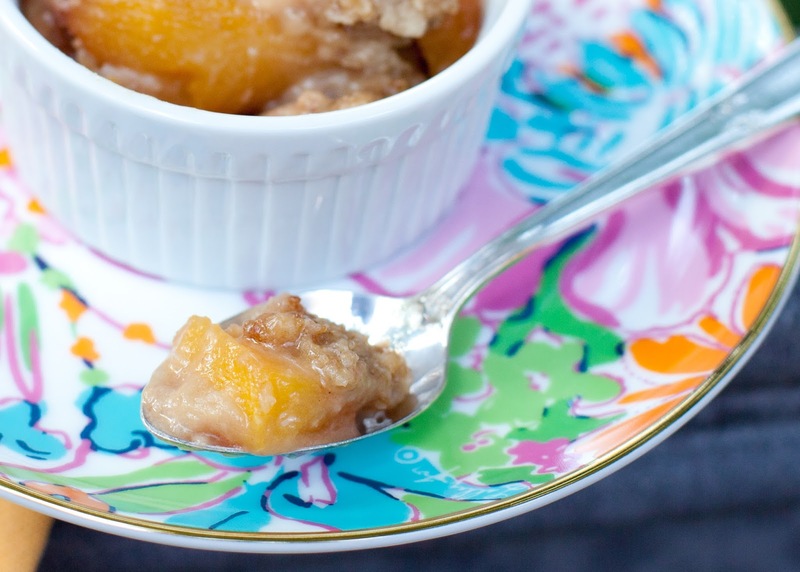 I found this recipe for Peach Crisp and it sounded perfect! 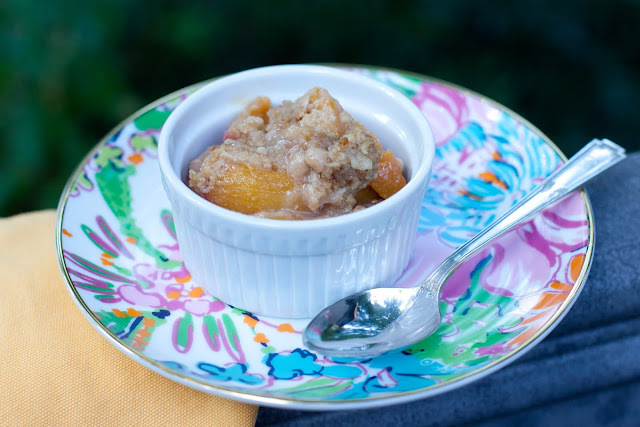 I peeled, pitted and sliced several peaches while my littlest man mixed up flour, white and brown sugar, cinnamon and nutmeg in a big bowl. He loves helping in the kitchen, and we have so much fun! It can, however, be a bit distracting having a two-year-old in the kitchen, and I ended up not following the recipe exactly. What we ended up with was so amazing though, that I'm going to make it the exact same way next time. And when I say next time, I mean as soon as our newest batch of peaches ripens. I'm counting the seconds. This peach crisp was that good. Accidently polishing off a quarter of the entire dish while sneaking in a tasting spoon good. I may or may not have sent Max a photo text at work, warning him if he didn't come home soon, there was a possibility I'd finish off the entire peach crisp before he could get any. It was literally all gone the next day. The best part? It was super easy. The original recipe actually calls for a sauce, which I did make but didn't care for. Plus, I don't think the dish really need anything added (even ice cream, and you know how I feel about my ice cream!). 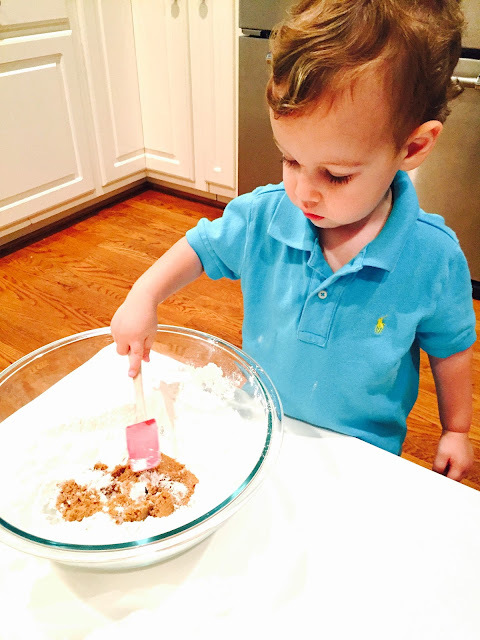 In a medium bowl, mix first five ingredients (best done by a two-year-old wielding a tiny spatula). Cut butter into small pieces and work in using a fork or pastry cutter. Set aside topping mixture. Peel, pit and slice peaches and place into a glass baking dish (8" or 9"). Zest half a lemon directly on peaches, and squeeze juice from lemon half on, then stir well. Cover peaches with crumb topping mixture, then cover with aluminum foil. Bake at 350 degrees for 15 minutes. Remove foil and bake 20 - 30 minutes longer, until the top is crisp and brown. Resist the desire to eat the entire thing straight out of the pan. I improvised (used gluten free pancake mix cause I didn't have flour) & this is baking in the toaster oven now. I can't wait to try it!